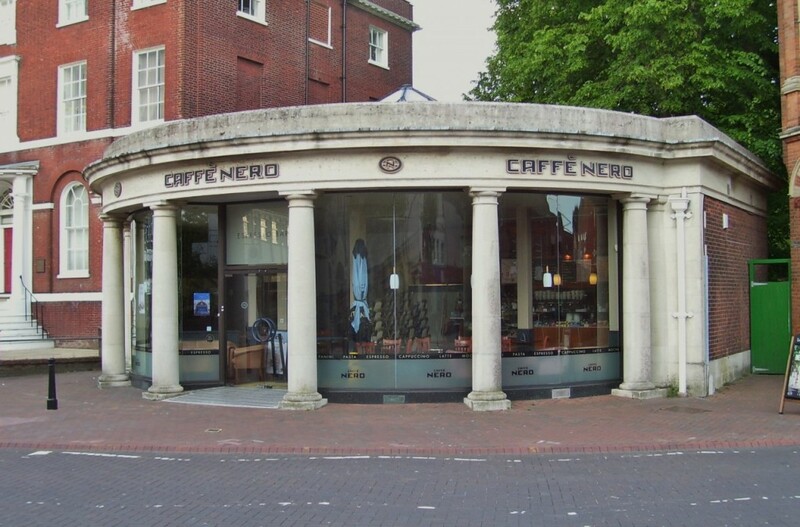 BRAIN TEASER: Caffe Nero – this is the Poole branch in High Street – can’t be necessarily be certain that the fresh milk they are using for their drinks is from a badger culling zone once it has reached the processor. Most countries that produce milk have a TB control policy in wildlife, so where do they get their imported fresh milk that is free from a TB wildlife culling zone? 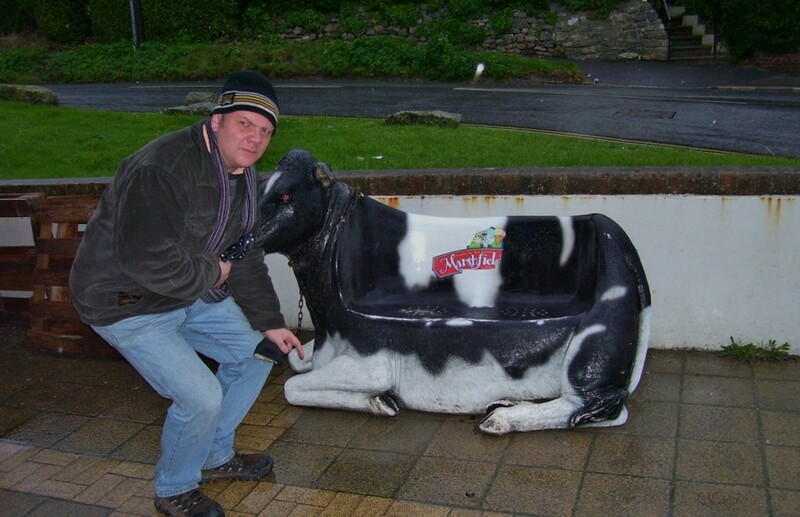 DOUBLE STANDARDS: This is an image many in rural communities will remember with distress in 2001. #StoptheCull throw their resources at dairy farmers participating in badger culling trial areas of the West Country but the groups behind this hashtag were silent when this was all happening. 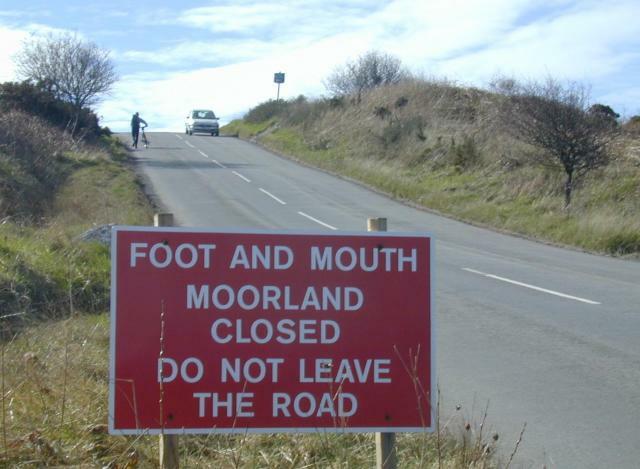 This was taken on the Yorkshire moors where many smallholders and hill farmers were hit very badly. Picture by Ben Gamble. UNCERTAIN FUTURE: Is this what could happen if dairy industry is sacrificed? Just an image of a plastic cow selling milk. 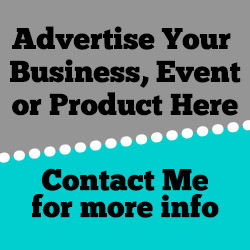 If you are reading this and in a position to influence decision making, act now. It’s not just the dairy farmer that goes but the rural knowledge and the supply chain that goes with them, like countryside management and maintenance. Don’t forget they are not being replaced. Picture by David Russell. 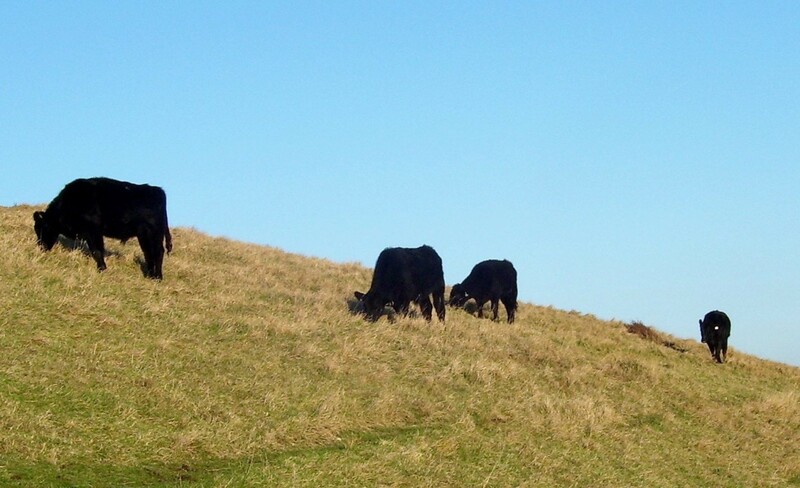 INCONVENIENT TRUTH: Cattle like these ones near Lulworth live a peaceful life but their bovine ancestors were slaughtered by the million in 2001 when nine in ten were perfectly healthy. The only animal welfare groups directly protesting against the Foot and Mouth Cull were the RSPCA and Compassion in World Farming. The folks behind #StoptheCull weren’t there. A COFFEE chain seems to forgotten some key facts in a knee-jerk response to threats from animal rights extremists on sourcing milk from areas where badgers are being culled to control bovine tuberculosis. Caffe Nero decided not to take milk from parts of Gloucestershire and Somerset where pilot trials of badger culling are being carried to ascertain whether or not it can stop the spread of the disease. Critics argue that the science disproves that any badger culls will affect the spread of bovine TB and say that biosecurity on farms should be improved. But a farmer posted on-line challenging how Caffe Nero could actually know exactly where its milk is being supplied from. Which leads me to one of two points that the Stop the Cull Coalition, have conveniently forgotten to tell the public in their short-sighted campaign that unfortunately Costa Coffee seems to have bought. If you refuse to source milk from areas of the country where culls are taking place and there isn’t any local milk available from areas where badger culling trials are not happening, isn’t it counterproductive and hypocritical to take it in an imported form where there is a TB culling policy in wildlife? As part of a TB eradication policy, badgers are culled in the Republic of Ireland and possums infected with TB are culled in New Zealand, so are the activists going to travel over to Ireland and New Zealand and harass farming families there? TB has also been found in cattle in the US. With the threats to our domestic security like Ebola, ISIS and MERS, isn’t this the very worst time to be attacking our food producers? This is absolutely insane. We are expected to take thousands of migrants fleeing North Africa and feed them as well as our own people. How exactly is that going to happen if a fashionable hashtag has been used to boycott businesses with the unforeseen consequence of pulling apart our food supply chain? My second issue is would this Twitter hashtag have been used in 2001 when ten million animals (nine in ten being perfectly healthy) were being butchered on the basis that the then Ministry of Agriculture, Fisheries and Food suspected cattle and other ruminant animals of having Foot and Mouth Disease (FMD) when in contiguous cull zones? Animals were declared the property of the State, their owners having no right of appeal and the expertise of vets from an outbreak 34 years before in 1967, was contemptuously ignored. Animals that were subsequently slaughtered had tests coming back showing they were actually healthy and not infected. How do I know? I covered this event as a rural affairs columnist on a regional newspaper and it made my physically sick and was the biggest act of animal cruelty in living memory. What was happening was so surreal if it wasn’t so tragic – it seemed some in the media at the time thought it was justified and invariably these were the same sections of the media who went absolutely apoplectic on shooting and hunting. Here is some footage to illustrate what is being said. And yes some of the groups shouting loudest the most about the badger cull now in 2015 – People for the Ethical Treatment of Animals (PETA); Vegetarian International Voice for Animals, the International Fund for Animal Welfare – were challenged in 2001 and I can reveal they they went to ground when asked to comment on this act of maladministration. Animal Aid have a past reference to this crisis on their website as to how bad the three kilometre contiguous cull was but I don’t recall them giving any practical help to any farmer or smallholder. The very creatures they claimed to protect were failed. In fact I found a quote from another group (not related to these three) who said the cull was justified as the animals were destined for the abattoir anyway. The collective bill for the country was £5B for agriculture and £3B for tourism. The RSPCA and Compassion in World Farming – to their credit – spoke out boldly, but not these groups. I’m sure the RSPCA and CiWF are against the badger cull and some of you reading this will obviously disagree or agree with them but at least they have a consistent track record on animal welfare issues, but not the groups above. When sheep, cattle, llamas and pigs were stranded in fields due to 22-day movement restrictions leading to the distressing state of seeing livestock literally starving to death, what did these groups do to help? Furthermore I have tried to highlight on my site a mallard drake nearly starving to death due to a bit of discarded tin being in its beak and on my Facebook page, a heifer strangled to death in North Yorkshire. The RSPCA were both involved in these issues, but not the groups above. This is one reason why the Labour Party is loathed in rural areas because one or two ministers apart like Jim Fitzpatrick, they offered no apology. So Caffe Nero, reflect on these inconvenient truths,pull your head in, stand up for your supply chain or try and find a cull-free imported source of fresh milk without passing the costs of this down to your customers. Without fresh milk, your profits will only plunge, not rise. How many coffee shops import their milk and who are they?